Key difference: The Xperia S features a 4.3-inch TFT touch screen with shatter proof sheet on scratch-resistant glass. The display provides an impressive 342 ppi density and is powered by a 1.5 GHz Qualcomm Dual-core processor. The Alcatel One Touch Idol Ultra features a 4.65 inch HD AMOLED capacitive touchscreen with a resolution of 720 x 1280 pixels. The phone is powered by Dual-core 1.2 GHz processor on a MediaTek MTK 6577 and 1 GB of RAM. The phone has a width of 6.45mm, which has led the company to tout it as the thinnest smartphone on the market. Sony is well-known electronics company that has made itself a popular manufacturer of smartphones. The company initially launched phones in collaboration with Ericsson, but it has parted ways with the company and has completely taken over the Xperia brand. The company announced a new line up of phones for the Xperia line-up, including Xperia S. The Xperia S was launched in February 2012 and was a high-range phone at that time, amount to approximately EUR 520. 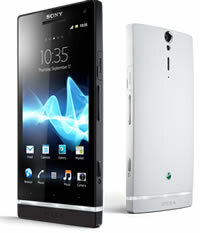 The Xperia S features a 4.3-inch TFT touch screen with shatter proof sheet on scratch-resistant glass. The display provides an impressive 342 ppi density, which was the highest at the time of the phone’s release. The high density ensures that the viewers get nothing but hi-res display with clear, crisp images and absolutely no pixilation. The device is a little bulky and heavy at 144 grams. The phone is encased in a plastic chassis, which comes off as a little cheap looking. The phone also said to creak and make noises when pressure is put on it. The Xperia S is a bar phone, which features a clear plastic strip on the bottom side of the phone that has the Home, Back and Menu button imprints on it but don’t let the imprint fool you, the buttons are actually located on the top of the clear strip and not on the strip. The top of the device houses the power/unlock button with the 3.55mm jack. The right side of the phone has the volume rocker, an HDMI out socket and the physical camera button, while the left side has a USB charging/sync port. The phone is powered by a 1.5 GHz Qualcomm Dual-core processor, making it quite fast when operational. The processor allows the user to seamless shift between screens and apps on the phone. It can also handle hi-res games, movies and multi-tasking. The device comes with Android v2.3, which is upgradeable to Android v4.0. The company has announced a 4.1 update, but release date for the update is not yet revealed. The device is available with 32 GB internal storage capacity and 1 GB RAM. The device does not support MicroSD cards, which means that the user is stuck with only 32 GB storage and this also causes a problem for the user to transfer data on to the phone. The device houses a 12.1 MP rear camera with autofocus and LED flash. The camera comes with Sony’s Exmor R for mobile technology and produces beautiful, colorful high-res images. The device is also capable of recording HD videos. The Xperia S also sports a 1.3 MP front camera for video calls, which is quite good compared to the other VGA and 1 MP cameras available on the other phones in the same price range. The Xperia S also comes with xLOUD Experience, clear stereo and clear bass and 3D surround sound for an amazing audio experience. The device is available with other features such as: Wi-Fi hotspot, DLNA, NFC and USB On-the-go. The S has a non-removable Li-Ion 1750 mAh battery, that provides 8 hours 30 min talk-time and 420 hours of standby time on 3G according to the company. Accelerometer, Proximity sensor, Ambient light sensor, Magnetometer and Gyroscope. GSM EDGE Up to 237 kbps; Wi-Fi hotspot; Wi-Fi, DLNA, NFC, USB.